As deck specialists our superior knowledge and mastery construction methods will optimise the functionality of your outdoor space. ACT Decks are constantly up to date with high caliber, industry preferred products, materials and trends. Our durable decks provide a quality investment for all homes. 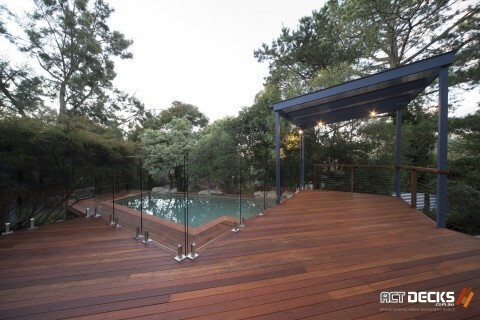 We offer a diversity of hardwood timber decking, each differing advantageous colours and characteristics. The decking we use is always of the greatest quality and always securely fixed down with screws, WE DO NOT NAIL. This is increases longevity as decks that are nailed down are prone to movement and pose as a safety hazard. The substructure of your deck is the key to its durability and the foundation of its aesthetics. Our deck sub frames are constructed from either timber or steel, both offer different benefits. We over engineer our sub frames doubling or in some case tripling what is specified in the National Construction Code. We understand that a deck needs to be able to tolerate excessive weight such as plants, furniture and entertaining. 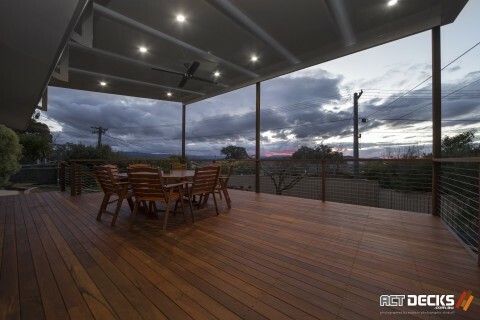 Not only are decks a classic addition, they optimise and influence vitality to your outdoor living space.